Where is God when we are hurting or in despair? How can we find hope even when we feel hopeless? Pain, struggle, and despair are part of life, and they test our character as God's people. John Wimmer approaches these challenges to our faith realistically and thoughtfully. He does not offer easy answers or platitudes like "Everything happens for a reason." We can't always understand or control many things that happen to us, but we can choose how we respond to our circumstances. 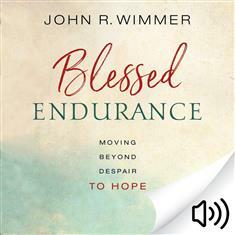 Wimmer encourages us to view times of difficulty as opportunities for spiritual and personal growth. Rather than diminishing our faith, pain and despair can lead us to greater trust in God. To endure through such times is a blessing. This inspiring book offers practical help for moving from pain and despair to hope. Wimmer reminds us that with hope we also have faithùnot the false belief that our lives will be pain-free but the assurance that God will be with us through our most challenging times and lead us to deeper levels of spiritual growth and wisdom. Click here for an interview with John Wimmer.